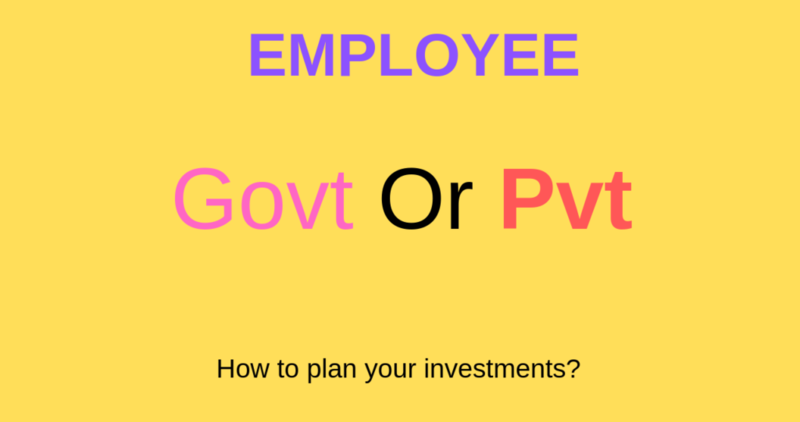 Employee Govt or Pvt who are planning for investment for their future financial goals, this article will help to some extent. 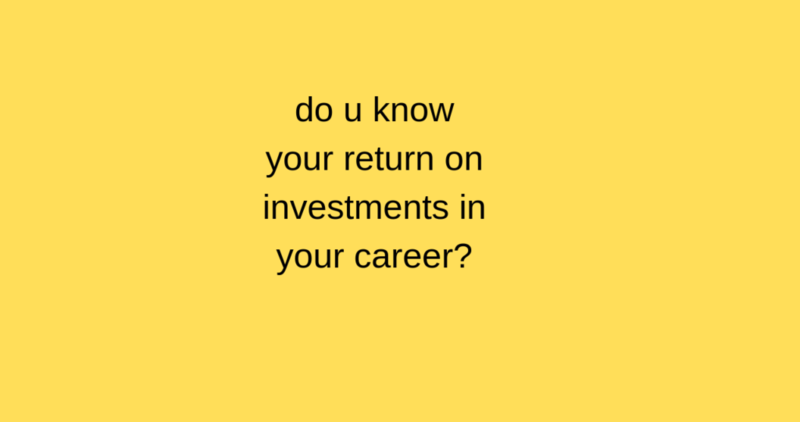 If I ask any salaried about the return they got from their investments? Then they simply say that they do not know. Instead, they will tell me that They have accumulated 30 lakh wealth or 1 crore wealth with their investments in their entire career. But this is not the right approach to do your investments. First, Primary objective in investments must be to beat inflation. Here, In this article, I am trying to calculate return on investment of a Government Employee with a real case study. The cash flows that he gave me may not be accurate and exactly what he has done in his entire career. ( I mean date of investments etc). In addition, this employee is my uncle. He shared his details with me. Moreover, if you are a State Government or Central Government or Private Employee, this article will help you to understand the return made from investments until retired. After, reading this article, retired employees can cross check their investment return in their entire service. The Govt. Employee of this case study is School Assistant Teacher. Moreover, He worked under Andhra Pradesh State Government. In addition, He got the Job in the year 1983 and got retired in the year 2017. So, He worked for 34 years as School Teacher. Moreover, He got retired as School Head Master at the retirement. His first month Gross salary in 1983 is Rs.750 per month, and his last salary when he got retired his per month gross salary is Rs.1,25,000. 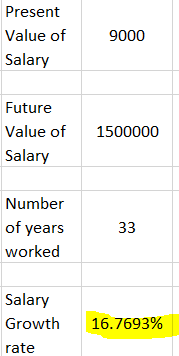 Here, in above calculation I have take 33 years as N because last year, the teacher got retired before salary hike. But his overall working years is 34 years only. It is very important to measure the inflation rate in this period. Moreover, I have already mentioned above a good investment should give more return than inflation. Here, Before understanding return on investment Let’s see How much more % his salary is grown over and above inflation. The inflation growth rate from 1983 to 2017 is approximately around 7%. However, You can find out the inflation growth rate and its impact on the purchasing power of money. 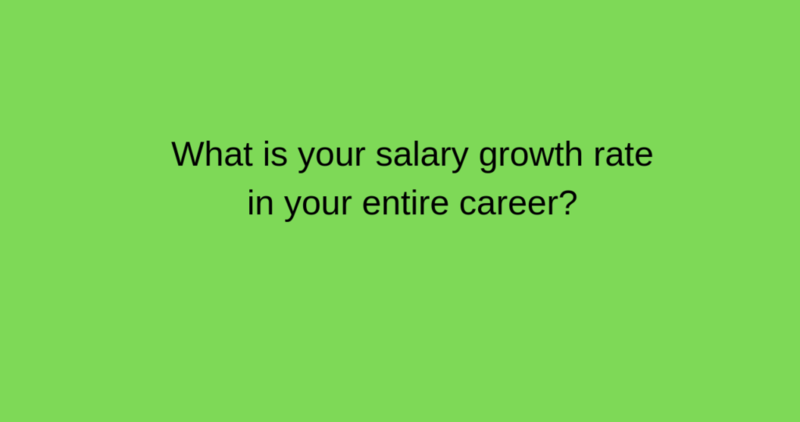 Finally, it is evident this employee got 9% more salary growth rate over and above the inflation growth rate in all his working years. He invested around 60% of his salary every year until he retired in various assets like chit funds, real estate, gold, and interest business. Moreover, The teacher never invested in Stocks or in Equity Mutual funds. As He had conducted tuition for the students and also as he some Form Land income, This teacher able to save or invest 60% of his salary for wealth creation in various assets like lands, gold, LIC Jeevan sree policy. In addition, those days Corporate schools are not that much famous. So, the teacher (Employee) was able to conduct private classes to students and was able to earn good amount of money apart from salary. In addition, The teacher had some agricultural income which is coming every year. As a result of this, he was able to save or invest 60% of his salary for wealth creation. Moreover, The teacher did gave money for interest to his co-Teachers for an interest of Rs.3 per 100 per month. This Govt Teacher has taken a Lic Jeevan Sree Policy and the maturity he received from this policy is Rs.25,00,000. He also received gratuity of Rs.30,00,000 at retirement. But it should not be calculated for calculating return on investment fort the teacher. As gratuity is not his investment. In addition, this teacher had not received any GPF corpus as his Department not provided him GPF. Moreover, He bought a house with loan, and the cost of that house is worth 50 lakh, when he retired. In addition, The teacher invested in some of the real estate properties ( empty lands) all these years. The cost of all these lands( including own house) is 1.45 crore. However, he has 30 lakh worth gold also at the time of retirement. Finally, The teacher’s (Employee) total wealth( excluding Gratuity) is 2 crores. 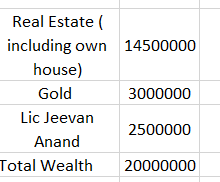 I have already wrote an article, How to calculate return on your investments like gold, real estate ( lands), house, and mutual funds and stocks etc. You can read the article here. Click here to read. Here, The Teacher got an “XIRR” of around 12.55% in his entire service on his investments up to his retirement. The cash flows and return of the Employee (Teacher) are shown in the below image. In his service, The Teacher (Employee ) taken only Endowment type policies. But These policies had delivered him only around 5% return to him. Moreover, Once the chit tenure is over he used to buy lands. In addition, if there is a shortfall to buy land, he used to borrow from private lenders or from banks. Though The teacher did interest business and had given money for an interest rate of Rs.3 per month per Rs.100. But the teacher’s profit ( return) is far below than the actual expected return of 36% per year. Here, If he was able to recover all the money in interest business, then his return would have been significantly higher than 12.55% return. In addition, The teacher invested in gold also. But gold investment had given him around 8% return only. As the teacher belongs to Guntur City of Andhra Pradesh, and as his city not witnessed any real estate problem like in Hyderabad city from the Year 2000 to 2015. Real Estate in Hyderabad When there is Telangana Movement for Seperation from Andhra pradesh. The above data I got from NHB residex. Click to see the website. However, If The Employee had faced Hyderbad kind of situation in his investments in real estate, then his return would have been significantly much below than 12.55% return( may be below the inflation rate). Hence, this teacher is lucky that he is not in the Hyderabad. So, The teacher was able to generate at least a 12.55% return from all his investments. But at present majority of his investments at retirement are in real estate ( empty land). Again, his wealth is at risk. As he is over exposed to single asset class ( real estate), any time his wealth and return can come down in case any thing happens Indian Real Estate. An example is Telangana ( Hyderabad real Estate ) before Partition from Andhra Pradesh. I agree that he accumulated 2 crore wealth with 12.55% return in real estate and Interest business. But his wealth should not stop growing from now also. I think those who are reading this article understood, What I mean? Here, The Teacher (Employee) would have accumulated more wealth if he had done asset allocation right. I will show the proof. You already understood, that this teacher got a return of 12.55% only from his investments till retirement. In addition, You understood If you buy real estate with a loan, it is not a profitable investment for you. Moreover, Please come out of the mind set that real estate will never come down and it will give more return than any other asset class. If the Teacher’s investments had generated 3.5% more return than shown in above images. His wealth would have been 3.18 cores which is 1.18 crore more than 2 crores. Yes, It is possible to get 16% return in installments without taking loan like in real estate. The asset class Sensex Value in Jan, 1983 is around 243 and in Dec, 2017 the sesex value is 34000. Moreover, the return given by sensex in this period is around 16%. Here, If You see the Teacher (Employee) in this case study generated a return of just 12.55% only by putting lot of efforts with chit funds, real estate ( land investment) and interest business. While at the same, investing in Sensex did not needed that much effort like the Teacher did. Moreover, Sensex had given 3.5% more return than his investments. So, His wealth would have been 50% more than the wealth that he has now. However, Sesex ( Equity) too has risk of getting low return or loss like it happened to real estate at Hyderabad (Telangana). However, investing in direct stocks or shares needs some skill and knowledge and effort. But investing in Equity mutual funds is not much difficult like investing in direct stocks (shares). However, some mutual fund scheme have delivered more return than the sensex too. 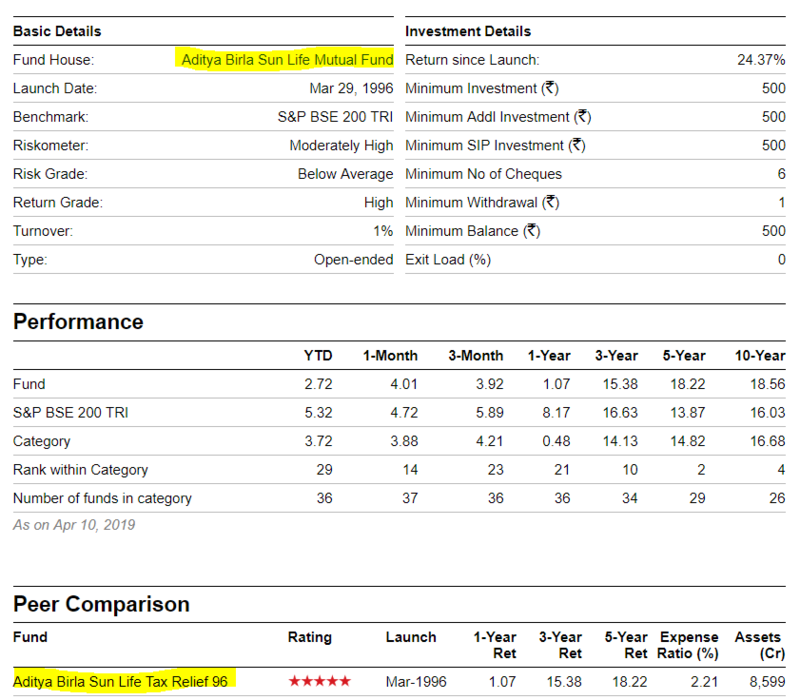 Here, If you see above image one of the fund of Birla Mutual Fund has generated a return of 24% on the invested amount since its lauch date ( from 1996) which double the return of the teacher ( Employee of the case study). Moreover, the category average return in the above image had given a return of 16% return for last 10 years which is also more than the return 12.55% of the Teacher (Employee in this case study). However, The past performance may or may not be repeated and you should always should know your risk tolerance before investing into any mutual fund Equity fund. In addition, You should choose the right asset allocation for your financial goals to accumulate corpus for your financial goals. I.e How much is in equity, fixed income ( ppf, debt funds, bank Fd etc). I will explain more about asset allocation in some other articles. In the case study we have observed that The teacher accumulated much lower return in spite lot of efforts with investments in chit funds, real estate and in interest business. Moreover, we also observed at the same time several mutual funds generated more return and wealth than Teacher in this article case study with minimum or with no effort. Hence, Mutual fund Equity should be your main asset class apart from real estate, and interest business. If you are still confused and would like to start your investment planning immediately. Then, The solution for you is to hire a Sebi Registered Investment Adviser. The cash flows given by the Teacher( my uncle) may not be accurate. But I am sure if you follow proper investment planning and asset allocation, then chances of accumulating more wealth for your financial goals than you are doing at present definitely will increase. Read article about I.T return filling benefits. Click here to read. As I said in this article, both real estate and Equity mutual funds both have the scope to give more return than inflation. But when it comes capital needed to invest real estate is not a good one to invest as it needs lump sum amount at a time. As a result of this we have to take loans and our return in real estate will be eaten by the interest that we have paid towards loans. In addition, Real estate is illiquid and at the same it is hyper inflated in India because of Black Money. Moreover, Real Estate in India is not transparent enough to trust. While at the same you can create wealth in mutual funds in installments. Here, in mutual funds as you are not paying any interest for loans, You return will be in your pocket only. Moreover, It is easy to follow asset allocation and re-balancing with the help of mutual funds. In addition, Mutual funds unlike real estate in India are well regulated and transparent. Hence, If you use equity mutual funds wisely, The chances of creating more wealth than the employee in this case study is a certain. However, This kind of investment planning Non-Salaried ( Self Employed like Business People etc) also can follow. But the truth is even they do not have enough awareness and interest.